Farmers in the Horn of Africa need urgent support to recover from consecutive lost harvests and to keep their breeding livestock healthy and productive at a time that pastures are the driest in years. 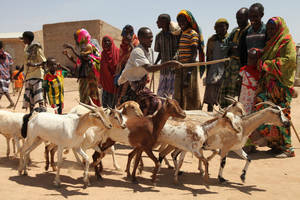 Photo: FAO News. Countries in the Horn of Africa are likely to see a rise in hunger and further decline of local livelihoods in the coming months, as farming families struggle with the knock-on effects of multiple droughts that hit the region this year, FAO warned today. Growing numbers of refugees in East Africa, meanwhile, are expected to place even more burden on already strained food and nutrition security. Currently, close to 12 million people across Ethiopia, Kenya and Somalia are in need of food assistance.